Could your city survive a nuclear apocalypse? We hope you never have to find out. Nevertheless, realtor.com looked at the 200 largest metros and rated each based on a number of factors, including the percentage of listings with a lake, pond or well (for drinking water); the percentage of listings with a safe room, bunker or fallout shelter; and the percentage of listings with solar power (in case the city power grid goes out), just to name a few. Based on those factors, Kansas City, Mo. is the best place to survive a nuclear apocalypse. Kansas City has one of the highest rates of listings with bunkers and fallout shelters, and most basements there are constructed out of brick — a material that is better equipped to withstand a nuclear blast. 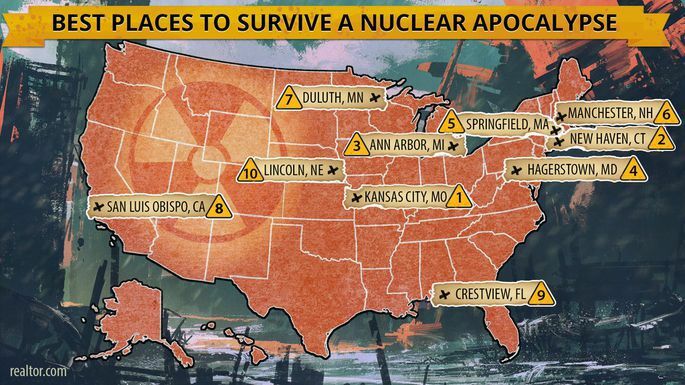 New York City, on the other hand, is the worst place to survive a nuclear apocalypse thanks to its large population and lack of natural resources. It would be impossible to forage for food and find water on your own, and the sheer number of people would make it nearly impossible to exit the city quickly as roadways, subways and trains would be overcrowded or inoperable. Los Angeles; Dallas; Nashville, Tenn.; Atlanta; Washington D.C.; Fayetteville, NC; and Seattle rounded out the worst places list for the same reasons. Duarte says New Yorkers and Los Angelinos shouldn’t feel too bad — everyone, including Kansas Citians, would have a tough time dealing with the fallout of a nuclear crisis.